The fall of America’s housing market last decade and the events that lead-up to the World Economy Collapsing feels like one of those events that could be considered “too soon” to make into a movie. Not due to sensitivity issues, or out of fear of offending those involved, but because there are so many factors to consider and so many moving parts to the enterprise that it could be decades until we can funny understand what happened. Unless, of course, the factors that led to the housing bubble bursting are depressingly simple; the people in charge didn’t know what the hell they were doing. To depict that on film will require a very subtle hand and a dramatic touch. Which is why you definitely get the director of farcical comedies like ‘Anchorman: The Legend of Ron Burgundy‘, ‘Step Brothers‘ and ‘The Other Guys‘, Adam McKay on board. But with an all-star cast and a comedic director, maybe the best way to portray those in charge of plummeting the world into an economic recession would be through big laughs. After all, the whole situation was one big joke in retrospect. In 2005, Michael Burry (Bale), the hedge fund manager at Scion Capital, discovers that the U.S. housing market is heading towards a collapse. Due to the banks not denying loans to those who could never be able to pay them back, it means that these high-risk loans will provide little return prompting a collapse in 2007. Wanting to profit off of this, Michael bets against the housing market and since the market is considered perfectly stable, the banks are more than willing to take his bet. Bond salesman Jared Vennett (Gosling) catches wind of this and also plans to profit but a wrong phone call also causes him to inform Wall Street Hedge Fund Manager Steve Baum (Carell) who is determined to find out just how the system could allow this to happen. The closest comparison to ‘The Big Short‘ would be 2013’s ‘The Wolf of Wall Street‘ and I’m not just talking about discovering the dirty under-belly of America’s financial marketplace and portraying a true-story in that environment. It’s also in the way the film is presented with a lot of fourth-wall breaking, narration, humorous cut-aways etc. While it may come across as trying to copy a formula that has worked very well in the past, it’s safe to say that director Adam McKay does a significantly better job aping Martin Scorsese than other directors in recent memory. But maybe that type of approach is necessary for complex, Wall Street true-story movies since both ‘The Big Short‘ and ‘The Wolf of Wall Street‘ are filled with dense, nigh incomprehensible terminology that will fly over the heads of the 99% and maybe that’s the entire point. While you may find yourself catching up to a few scenes beforehand once you’ve wrapped your head around what a “credit default swap” or a “collateralized debt obligation” (or “CDO”) is, you’re still able to follow the movie well enough because it moves at just the right pace and it feels like these characters are learning about the corrupt nature of America’s housing-market as they go along with the audience. There’s usually at least one character on-hand to ask what is going on or demanding some form of clarification which gives the audience a cipher in which to absorb the necessary information. 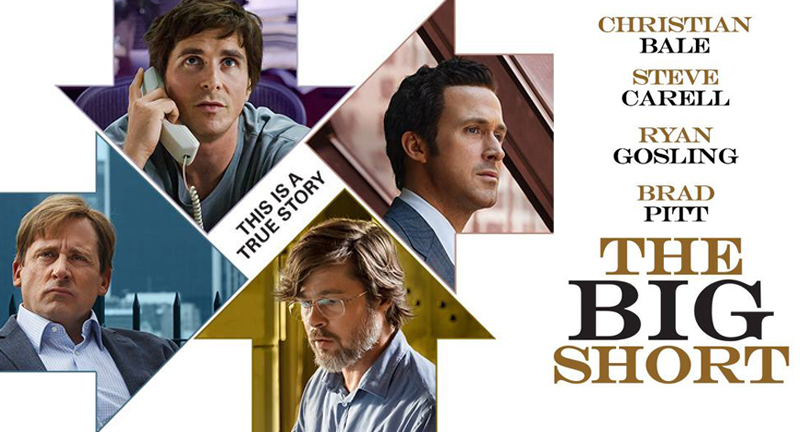 With a story this complex, it’s a necessity yet it doesn’t feel like ‘The Big Short‘ is dumbing its story down. And when there are no such characters on hand, Adam McKay is quick to provide a gut-bustingly funny celebrity cameo to explain things in a friendly environment to the audience. But spoiling just who the cameos are comprised of or how they’re presented would be telling. Yes, we can blame the big bankers who knowingly and fraudulently exploited the system and the American people for their own selfish, capitalist greed. Yes, even those with the foresight and the resources to see the collapse coming (the “heroes” of the movie) are trying to profit off of it. And yes, it’s easy to say that the people in charge were too stupid, too selfish and too short-sighted to stop what amounted to a worldwide, economic recession with consequences that are still being felt to this day. But maybe a portion of that blame has to go to us, the general public, the 99% who could have also seen it coming if we spent more time paying attention to what our governments and bankers were doing instead of being distracted by shallow interests. Maybe if we paid more attention to politics or the economy instead of the latest, untalented faux celebrity, ultimately irrelevant sporting event, or tabloid gossip, we could have also seen this coming and prepared for it, or at least know who was accountable in the court of public opinion. It’s more of a subliminal message that I’ve gleamed by looking at a small aspect of the movie and ‘The Big Short‘ is hardly a 99% take-down but I think that its screenplay is brave enough to suggest that perhaps the big banks aren’t the ENTIRE problem, even though they certainly are a big part of it. Especially with the final moments of the film presenting some depressing exposition through text that shows that the bankers and those in charge haven’t learned a god-damn thing. Who needs hindsight when there’s cold, hard cash to be made? With the cast, it’s surprising who ends up standing out. Christian Bale’s character, Michael Burry, is vital to the plot but as a character he’s not far removed from countless other socially-awkward, neurotic businessman who only understand the numbers. He walks around his office barefoot, plays the drums loudly, listens to heavy-metal and looks at numbers all day but there’s not a lot of depth to him. Bale does a terrific job giving him lots of facial ticks and a fascinating on-screen presence but there’s not a lot to remember about Burry as a character. Ryan Gosling gets many of the funniest lines of the movie but feels like a re-skinned Jordan Belfort from ‘The Wolf of Wall Street‘ and while Brad Pitt is nearly unrecognisable as paranoid, retired banker Ben Rickert, his role amounts to an extended, glorified cameo. Though it’s admirable that this is another movie that Brad Pitt has produced recently that tackle hard-hitting social issues like ‘Selma‘ and ‘12 Years a Slave‘ (the only Oscar he’s ever won). Pitt is clearly a great producer, funding movies that feel like they deserve to be made about stories that deserve to be told. The real-standouts of the cast come from John Magaro and Finn Wittrock as two amateur investors who stumble across Michael Burry’s findings and bring in Ben Rickert to help them bet against the banks. Their story-arc initially feels like it’s taking up a bit too much screen-time as these two are relatively inexperienced and not as interesting to watch as the rest of the cast. But when they’re confronted by Rickert near the end of the movie about the consequences of their profiteering, their arc starts to come together and hits home just how depressing this situation really is and how the people we’re following in this movie are not necessarily the good guys. Which is exacerbated even further through Steve Carell as Mark Baum and…Carell might have given the best performance of his career in ‘The Big Short‘. ‘Foxcatcher‘ last year proved that he had dramatic chops and his numerous comedic performances have proved his natural gift for comedy. But with ‘The Big Short‘ it feels like the best of both worlds as he’s essentially playing the “Are you effing kidding me? !” character. He’s a naturally angry individual, but as the movie progresses and he learns that he’s only scratched the surface on the corruption taking place in America’s banking system and greed being the sole motivating factor at play here, he just absolutely loses it and Carell carries that ideal to the best extreme possible. There’s so much happening internally with this character and Carell gives easily one of the best performances in recent memory and I’m kinda amazed that out of all the actors in ‘The Big Short‘ that could have been nominated for an acting Oscar this year, that it was Christian Bale of all people and NOT Steve Carell. The only thing really holding back Baum as a character is that it would seem a lot of his emotional-baggage has been left on the cutting room floor. We learn that his brother committed suicide and that he was terrible at emotionally supporting him beforehand, but then it’s dropped for over an hour and comes right out of nowhere near the end. It feels like a stop-start, pace-breaking plot-point that didn’t really add much to what was already an incredibly complex and engaging character without it. Also, when watching the trailer back you’ll notice a few lines and moments that didn’t wind up in the final movie which indicates that maybe some aspects and story-points in the movie were cut. Maybe those cuts were made to help the pacing as despite being a 130 minute movie, it feels shorter and it does feel like an exhilarating ride that is never boring despite the depressing and grounded subject-matter. It is edited incredibly well, the transitions are engaging and the camera-work is great, but not too stylish to serve as a distraction from the subject matter. The music by Nicholas Britell didn’t leave much of an impact, however. Honestly, there’s not much to say about the production of ‘The Big Short‘ which indicates that it was very well put together. You only really notice the subtle nuances of film production if something is done badly. ‘The Big Short‘ may not be the best of the eight movies nominated for “Best Picture” at the Oscars, but it’s potentially the most important as it delves deep into a very relevant topic and manages to make it accessible to the average movie-goer without dumbing it down and diluting the story’s ultimate impact. Adam McKay was an inspired choice as many of the sequences delve into very dark comedy with many moments that will have you shaking your head in disbelief that things actually happened this way, just like Steve Carell does in a phenomenal, career-best performance. McKay is the perfect director to see the farce in the housing bubble fiasco and is quick and right to place most of the blame on the irresponsible, hubristic bankers put in charge of the country. But what were WE, the people, paying attention to during that time? I give ‘The Big Short‘ 4 and a half stars out of 5.